Panus Semi-Trailers and their highly regarded partner Portland Precision Engineering, based in the South-West Victorian town of Portland, have recently completed their first joint project, designing and building a B-Double set of Wood Chip Transport Trailers which have been developed specifically for Tony Hutton and S.T. Transport. This fourth generation B-Double Chip Bin design set will be used to cart woodchips from within the local Green Triangle forestry region, down to the Portland Port, ready for export. Utilising a purpose-built customised set of Panus Light-Weight B-Double Skeletal trailers, Portland Precision Engineering’s Jon Dennis and his expert team manufactured a customised set of bins that were mounted to the trailers using traditional twist-lock beams. The resultant overall tare weight is an impressive 13.5 tonnes. 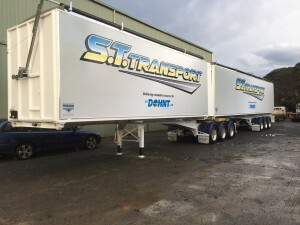 Tony Hutton has been actively involved in this project and his input alongside Jon has been invaluable as Panus and Portland Precision Engineering went about designing these woodchip trailers that didn’t just tow well, but would allow S.T. Transport to achieve an optimal payload of above 45 tonnes. However, it is also the detail around the little things that will ensure these trailers will suit the application perfectly. For example, consideration had to be given around the design of the rear frame and bumper to incorporate sloped plates that ensured during discharge, woodchips would easily flow out through the bins without causing spillage and leaving residual woodchips caught within the trailer. Tony has put this first set of Woodchip trailers to work and the eye-catching trailers have already captured the attention of a number of other operators who have identified the opportunity of involving their business with the global expertise of Panus Semi-Trailers whilst still maintaining their strong local affinity with Jon and his team at Portland Precision Engineering who will provide invaluable and timely service and support.